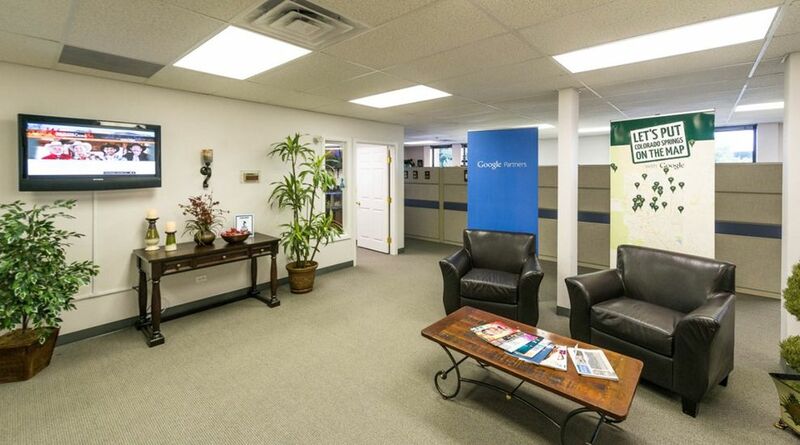 What is now a fruitful and ever-growing Colorado Springs, Colorado Digital Agency began as a seed of curiosity with Andy Meng, the co-founder of Infront and its predecessor, “Data Made Accessible.” After serving in the Navy for several years, Meng came back with a fervent desire to work with technology. In 1994, Meng and his brother formed DMA and conducted research for the U.S. Department of Agriculture. DMA’s rapid success in the growing digital world led to a name change that would better reflect Andy Meng’s passion for success. 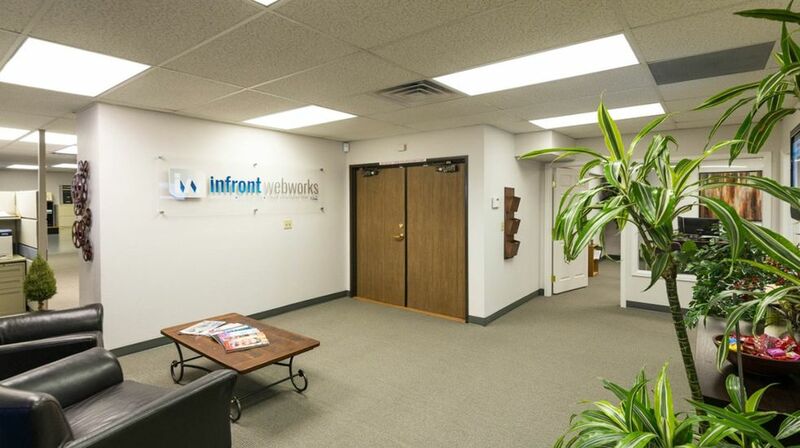 In 1999, Infront Webworks was born. In April of 2011, Andy Meng sold his company to Matthew Palis, the current President of Infront Webworks. Palis was looking for a promising seed company to invest in that was “the type of Online Agency that the 21st century companies desire and need to work with.” With Infront’s unique combination of staff, services, & clients,” Palis knew that Infront was exactly the kind of company he was looking for. Currently, Andy Meng is with Infront as the Director of Business Development. He works one-on-one with small business owners to build credible, usable, and findable websites. He frequently consults with the management team on the strategic direction of the company. What is your major service sectors? Infront Webworks has a growing team of experts. A committed senior staff that has proven to be leaders in the Digital Agency industry and will continue to guide an expanding team of creative and hard-working individuals. Unlike most competitors in the realm of Digital Agencies, Infront does not spend nearly as much time or expense on building sales channels. Instead, Infront focuses their efforts on building a respectable, client-tailored process that has launched effective client websites and SEO with definitive results . This model provides a solid win/win for clients and Infront Webworks. Because of high success rate for clients and an amazing client retention rate of over 90% the SEO and online marketing department at Infront has seen the results. In just the last 3 years they maintain over 65% growth year over year in 2013, 2014 and 2015, with projected growth over 100% in 2016. “Clients stay on with the Infront SEO team because we deliver client results and hire experts in the field” says Hodgdon. Through ambassadorship (blogging, events, etc. ), professional training and certifications, Infront has the ability to mold an expert team dedicated to providing clients with quality measurable results. Infront's team has a collective understanding of the company’s core values. As the name of the company suggests, being at the ‘forefront’ of technology, trends, and innovation is at the core of the Infront credo. 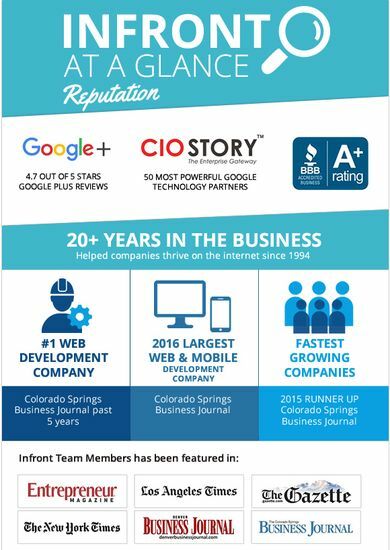 The Infront team members are Google Certified Partners, Google Trusted Local Verifiers, and have a combined total of 29 certifications in Google Marketing Products. Infront is always polishing the Company Core Values and competencies to meet the needs of an ever-evolving digital world and, most of all, to meet the needs of the clients. By working with Google, Hubspot, and other industry leaders, Infront will continue to thrive in a world where change is inevitable and the old is constantly being pushed out by the new. Our core purpose at Infront is to liberate - We leverage online technologies to create effective and innovative solutions that inspire and empower with the intention that our clients are liberated from their daily grind, and have time to be creative, satisfy their curiosity, and achieve their goals. Our core values are teamwork, passion, innovation, impact, fun and honesty. How you place your company in the market? Infront has perpetuated its success for over twenty years. They attribute success to an absolute commitment to excellence and innovation. From the passionate mind of Infront’s founder Andy Meng to the dedicated drive of Infront’s current president Matthew Palis, the talented team at Infront has great plans for the future. The number one priority for the company is to keep hiring top talented and passionate individuals. Experts in the digital fields will enhance the company vision and propel the company forward. With such high achievements already under their belt, the Infront team is well on their way to national success in the realm of Digital Agencies. How is your working Environment? With “lunch and learns”, company outings, a company health club, and collaborative get-togethers, Infront enables its employees to grow, brainstorm, and exchange ideas in an environment that fuels success. Having the ability to bring talented, passionate individuals together under the wing of great leadership is what has made Infront an industry leader in Colorado Springs, Colorado for over twenty years. Infront’s senior staff consists of seasoned veterans well known for their accomplishments in the Digital Agency market. Matthew Palis began his technology career in 1994 with the Fortune 500 Company Cabletron Systems. Later, Palis founded North East Internet Publishing (neip.com) and provided web development, online marketing, and hosting services to an international client base. The company grew tremendously and after five years, NEIP merged with the regional company ISP TTLC Internet. Andy earned his Bachelor of Science in Finance from the University of Missouri in 1982, and was well on his way to an MBA when he got the call to serve his country to fly jets in the Navy in 1984. Andy went to Pensacola for Aviation Officer Candidate School after which he spent nine years in the U.S. Navy as a Naval Flight Officer who achieved over 300 aircraft carrier landings, 100 of them at night. 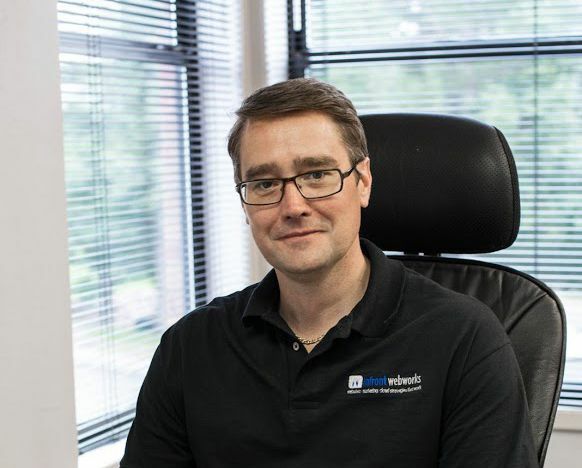 After his stint in the Navy, he wanted to get back to his home state of Colorado, so in 1994 he moved to Colorado Springs and started Infront Webworks and has successfully guided the company building thousands of websites in the process. Mike Hodgdon has been an online entrepreneur since 1997. He has 19+ years of experience owning/operating various web design, SEO, online marketing, and Internet advertising companies. Hodgdon has been featured in many renowned publications like Entrepreneur Magazine, Mobile Marketing Association Newsletter, N.Y. Times, L.A. Times, Colorado Springs Business Journal, to name a few, he has a solid track record of successful online undertakings. He Holds Google certifications including AdWords Search, AdWords Display, Video, Shopping, and Mobile Advertising. For ten years, Steve Yashur worked as the web developer and systems administrator for several medium and large companies. He took his role as Technical Director of Infront in 2005 and has a talent for explaining and breaking down complex problems. What factors you take into action when you prepare cost plan of a project? Infront’s website design and development team takes projects from as low as a couple thousand to enterprise level websites in the hundreds of thousands. All projects are bid on a per project basis once needs are identified. Average price is $8,500.00. They do also have an SMB (Small and Midsize Business) division that offers semi-templated websites that are Fully Mobile Responsive for $2,250. Infront’s SEO department has tiered SEO programs based on client needs and they range from $300.00 monthly to $5,500 monthly. The average Fully Managed SEO program runs $850.00 monthly and includes all aspects of SEO, their Fully Managed SEO programs are just that, “Fully Managed” by senior SEO Specialists and they do no outsourcing to India or hiring of interns. All SEO is done in-house by expert SEO Specialists. What are the main challenges and problems you face? Being 20+ years in business one consistent obstacle is having to regain client trust and confidence when they have worked with small companies or freelance website designers and SEO’s that did not effectively deliver or communicate with the client. The forefront of the services they offer are based on “Trust, Transparency, and Communication” because they know that the relationship with the client grows by providing effective solutions to clients while empowering them to be as much a part of the process they are comfortable with. The Infront team understands “the customer has to come first and they have to over deliver on website and SEO projects they take on”! Why your customers are happy? Infront Webworks customer service begins with the first sales call. Whether they are on an inbound call to answer a potential client’s needs, or an outbound call to begin a new client relationship, they are always working to ferret out the client’s expectations. It is their belief that good customer service begins with this conversation about expectations, and one of the most important parts of a project is to continually evaluate and manage these expectations. They’ve also put a huge emphasis on communication with the client in all of their processes. For example, a new marketing client hears from them 3 times in the first 2 days, and are offered and encouraged to attend monthly strategy meetings. We strategize (decide what we’re going to do based on client need), implement (do it), and analyze (what was the result) every single month with their marketing clients. They have a very similar process for web development clients. It starts with the sales meeting and understanding the client’s expectations. We ask them to fill out a questionnaire, and this is the basis of our first meeting where they kick off the new site design. They stay in close communication during several rounds of a design process. Once they are finished with design and are developing the site, Infront’ s team communicates weekly on progress and timeframe. 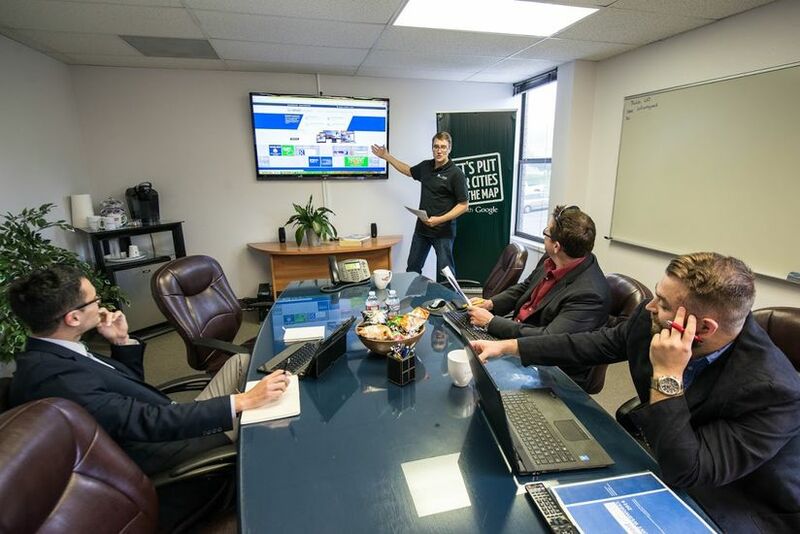 When done with development, they have the client in for a meeting to present the new site and to train them on their content management system. This is often a great time to talk again about expectations and how they were or were not met, how practical they are, and how much it will cost to meet new ones. Infront has perpetuated its success for over twenty years. From the passionate mind of Infront’s founder Andy Meng to the dedicated drive of Infront’s current president Matthew Palis, the talented team at Infront has great plans for the future. The number one priority for the company is to keep hiring expert, talented and passionate professionals. Experts in the digital fields will enhance the company vision and propel the company forward. By employing leading experts in the industry they feel they can continue to provide client solutions that deliver results, solve problems, and generate client revenue. With such high achievements already under their belt, the Infront team looks forward to continued success for clients and to only grow in the ranks of renowned Digital Agencies.